Upon your arrival, you will find The Cozy Inn offers a wonderful Old Florida Experience with its unique & varied hotel accommodations and other luxury options. We offer every option for the traveler or longer term guest that you can imagine, from our standard motel rooms to our luxury suites and townhouses. For those special occasions – when you must have the ultimate in romance and luxurious surroundings – we have the Deluxe Honeymoon/ Anniversary/Executive Suite! Whether you stay for a few days, for a wonderful Weekend Getaway, or for a week or more, we offer every kind of St. Augustine accommodation you would need. Where else in St. Augustine can you find a Kid Friendly and Pet Friendly hotel (nominal pet fee) that is also versatile enough to remain an extremely private and romantic Inn at the same time? We know that St. Augustine lends itself to both romantic and family friendly vacations, so why shouldn’t your hotel? 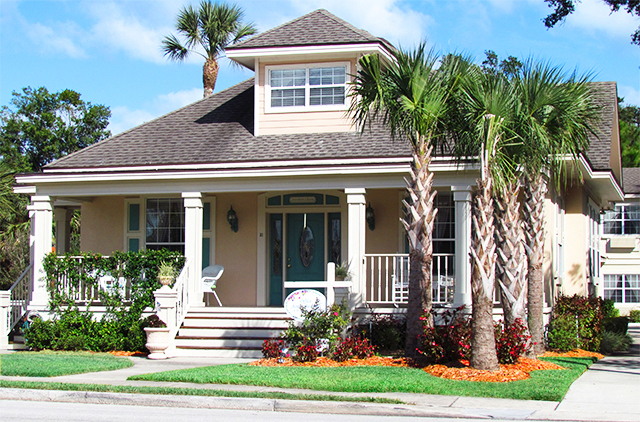 We have the properties and accommodations to make any variation on a St. Augustine vacation a reality. Our Cozy Inn has undergone a wonderful transformation to become one of the most versatile and accommodating St. Augustine Inns. After five years of renovation, we have two main guest quarters. The Cozy Inn West is comprised of renovated small & “cozy” motel rooms in the Old Florida style with individual parking in front of each room. The Cozy Inn East has two separate buildings. One building is a gracious Old Southern Style House which has been rebuilt and modernized to suit today’s needs. The House holds four luxury suites, including a 750 square foot Luxury Honeymoon/Anniversary/Executive Suite. The second building is a five “Townhouse Row” and was also rebuilt and modernized for the expectations of today’s travelers with individual parking in front of each unit. See the Accommodations section of this site for more information as well as photos. Come and stay with us and see how The Cozy Inn got its name. While staying at The Cozy Inn, you’ll receive a warm welcome from our staff. Our staff is caring and helpful and will assist you in any way possible to ensure you have a wonderful vacation. They will guide you to the sites of interest and great eateries where the St. Augustine locals go. Your accommodations will exceed your expectations! Being a small family owned property we pride ourselves in providing spotless rooms and friendly service to ensure you have a wonderful stay. Come stay with us and we’ll make sure your experience at our Cozy St. Augustine Inn is a wonderful one.